Apparu en tant qu’État en 1838 avec la disparition des Provinces-Unies d’Amérique centrale, le Nicaragua, le plus étendu des États d’Amérique centrale, occupe un territoire de plus de 130.000 km2 entre le Honduras au nord et le Costa Rica au sud. L’influence américaine y a toujours été dominante et, au début du siècle, le premier régime moderne, celui du président José Santos Zelaya (1893-1909), n’échappe pas à la règle, bien que la présence d’instructeurs bavarois à l’École des cadets ait ajouté une touche européenne au paysage. 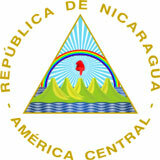 Nicaragua emerged as an independent state after the dissolution of the the federation known as the United Provinces of Central America in 1838. During its first 50 years as a new nation, no organization that could be termed a national army existed. 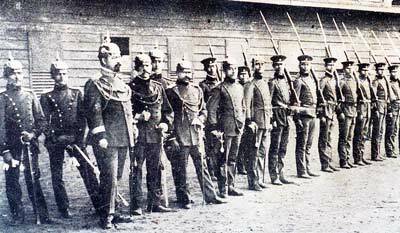 Although American influence in Nicaragua had been substantial, the presence of German military advisers at the turn of the twentieth century led to the adoption of a German-style uniform for its officers. This was best exemplified by the Pickelhaube, including a white horsehair Haarbusch, worn at ceremonial events. Following a period of intense unrest and to preserve American economic interests, the US military occupied the country from 1912 to 1925. Two years later the US Marines returned to help stabilize a country rapidly descending into political and economic chaos. During this period a Guardia Nacional (GN) was established and trained by the American General Douglas C. McDougal to help the Americans maintain order. 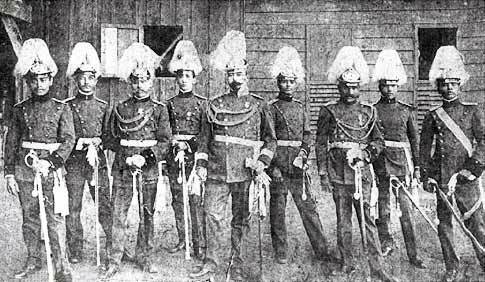 Hats and some pith helmets were the only headgear worn by the members of this military organization. 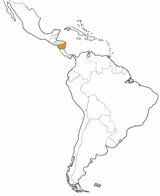 American troops departed Nicaragua in 1933 shortly after the beginning of the Sandinista insurrection. In 1936 Anastasio “Tacho” Somoza, former commander of the GN, seized power and began a long western-oriented dictatorship until his assassination in 1956. The officers of the 3000-man GN wore American pith helmets decorated on the front with the letters GN for Guardia Nacional. With implementation of the Lend-Lease Act (1941) a small quantity of M1917-A1 helmets were delivered to Nicaragua as they were throughout Central America. However, these helmets seem to have been used on a very limited basis. Following 1947, with the signature by Managua of the Inter-American Treaty of Reciprocal Assistance (Rio Treaty), a number of US M1 helmets were imported. In some cases the liners of these helmets were decorated with the state emblem located on the right side of the shell. Having a history of close ties to Israel, Managua imported in late 1970 a large quantity of military equipment from the Hebrew state. Included were a number of Orlite 201 (M76) helmets, as well as its camouflaged version. In August 1982 the Sandinista (leftist) government of Daniel Ortega, in power since 1979, terminated its relations with Israel, and a new era of military procurement began. A number of East European helmets were imported, including the Soviet Ssh-68, which appears in most photographs of military parades in Managua during this period. Some Bulgarian M72 models were also conspicuous at this time. With the ouster of the Sandinistas in 1990, the American made PASGT helmet was introduced. These are currently the standard issue helmet in the Nicaraguan Army. However, the Orlite helmet remains in use with some armored units as well as with the First Battalion of the National Guard. In addition, the traditional Soviet, soft, black headgear continues to be issued to tank crews.